What is a disc, and what is its purpose? The spinal cord is one of the most important and sensitive organ systems in the body. If it is damaged, the nerve cells do not regenerate but are replaced with fibrous or scar tissue. Spinal cord injuries usually result in permanent, irreversible damage. To protect it from damage, the spinal cord runs through a bony canal within the spine and is surrounded by protective bone everywhere except the junction of the vertebrae. These junctions are filled by rubber-like cushions called intervertebral discs. The individual vertebrae and intervertebral discs allow the back to move up and down and sideways without allowing contact between the bones of the spinal column. This extreme protection of the spinal cord reflects its importance and fragility. What does it mean for a disc to rupture, and how does it happen? "The disc is composed of two parts." The disc is composed of two parts. The outer covering (fibrous ring) is much like a thick shell. It is comprised of tough fibers that protect and contain the central part (pulpy nucleus). The disc is thinnest at the top. This thin area is located just below the spinal cord. The central part of the disc is much softer than the outer part and has the consistency of thick toothpaste. Degenerative disc disease causes spontaneous degeneration of the outer part of the disc, resulting in sudden disc rupture or herniation (also called a "slipped disc"). It may not be related to injury, although the rupture frequently occurs after some sort of traumatic event, such as a fall or a relatively small jump. Although this act is frequently blamed for the disc rupture, the injury actually occurred due to chronic disc degeneration. Most dogs with degenerative disc disease are middle-aged, from three to seven years old. There is likely a genetic predisposition to this disease. Certain breeds, especially the Dachshund, Poodle, Pekinese, Lhasa Apso, German Shepherd Dog, Doberman, and Cocker Spaniel have a high incidence of intervertebral disc disease. "Because the spinal cord is encased within its bony canal, it cannot move away from the pressure and it becomes 'pinched'." When the outer shell degenerates, it allows the central part of the disc to escape. Since the disc is thinnest near the spinal cord, disc material that escapes through the tear usually goes upward, putting pressure on the spinal cord. Because the spinal cord is encased within its bony canal, it cannot move away from the pressure and it becomes "pinched". How does a slipped disc affect the spinal cord? The spinal cord is like a telephone cable carrying thousands of tiny wires. When it is crushed, transmission of information through the wires is slowed or stopped. When the disc degenerates and ruptures, it crushes the spinal cord and the nerves that leave the spinal cord over the discs (i.e., spinal nerves). Pressure on the spinal nerves results in pain. Pressure on the spinal cord results in pain and/or loss of information transmission, causing partial or complete paralysis, along with other neurological deficits. 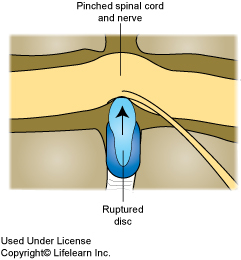 Most disc ruptures occur in the middle to lower part of the back. However, they may also occur in the neck. Back injuries often cause paralysis without severe pain while neck injuries usually cause severe pain without paralysis. If paralysis affects all four legs, the disc rupture must be in the neck. Due to the way nerve tracts are arranged in the spinal cord, disc ruptures in the neck may affect the rear legs first and may not involve the front limbs. 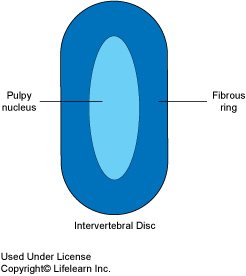 How fast do intervertebral discs degenerate and rupture? "Some dogs will go from normal walking to total paralysis in less than one hour." Disc degeneration occurs relatively slowly, and a rupture may occur slowly and gradually, so that degenerated disc material slowly escapes from the disc over several days or weeks. In these cases, the dog often experiences pain and is reluctant to move. It may lie around for a few days allowing the body to try to heal the injury, often without the owner being aware that a problem existed. However, discs may also rupture very acutely. Some dogs will go from normal walking to total paralysis in less than one hour. A presumptive diagnosis of disc disease will be based on the dog's history of neck or back pain, uncoordinated walking, or paralysis, with or without a history of recent trauma. If the dog is one of the high incidence breeds, this disease will be high on the list of potential causes of the patient's symptoms. "...a myelogram may be performed." In some cases, plain radiographs (X-rays) may assist the diagnosis. However, plain radiographs may show no abnormalities, since neither the disc nor the spinal cord is readily visible on an X-ray. If the diagnosis is in doubt or if the patient will undergo surgery, a myelogram may be performed. This procedure involves injecting a special dye around the spinal cord of the anesthetized dog and then taking a series of X-rays. The dye will outline the spinal cord. A break in the dye column means that there is pressure on the spinal cord at that point. If available, computed tomography (CT) scans and magnetic resonance imaging (MRI) may be used to diagnose intervertebral disc herniation. How do you know if the pressure on the spinal cord is due to a disc or something else? It is possible that the pressure on the spinal cord is due to a blood clot or tumor. Both are possible but rare, especially when compared to disc ruptures. If the patient is a high-risk breed and there has been a sudden onset of paralysis without severe trauma, there is an approximately 95% chance that a disc rupture is causing the clinical signs. However, the diagnosis is not definite until the time of surgery. Are all disc ruptures treated with surgery? Stage I disc disease produces mild pain and is usually self-correcting in a few days. Stage II disc disease causes moderate to severe pain in the neck or lumbar (lower back) area. Stage III disc disease causes partial paralysis (paresis) and results in the dog walking in staggering or uncoordinated movements. Stage IV disc disease causes paralysis but the ability to feel is present. Stage V disc disease causes paralysis and loss of feeling. These stages tend to overlap in some dogs, and dogs may move from one stage to another over a period of hours to days. Dogs with Stage II and III disease are usually treated with anti-inflammatory drugs, pain relievers, and exercise restriction. If the pain or lack of coordinated movements persists after four to seven days of treatment or if the neurological status declines from one day to the next, surgery may be required. The time of confinement will vary based on each patient's condition. Dogs with Stage IV disease should have surgery, although a small percentage will recover without it. Dogs with Stage V disease should have surgery immediately. The sooner that surgery is done, the better the prognosis. Ideally, these dogs should be operated on within the first 24 hours of the onset of paralysis. "The goal of surgery is to remove pressure from the spinal cord." The goal of surgery is to remove pressure from the spinal cord. 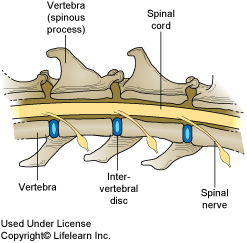 If the disc rupture occurs in the lower back, a "window" (called a fenestration) is made in the side of the vertebral bone to expose the spinal cord. This window allows removal of disc material and relieves pressure from the cord. If the disc rupture occurs in the neck, a window is made in the bone exposing the spinal cord. This may be done from either the top or the bottom, depending on the situation and the veterinarian's preference. What is the success rate for treating disc disease with and without surgery? When will we know if the surgery is successful? Unfortunately, success cannot be determined immediately. The return of neurological function, walking ability, and relief from pain may not occur for several days to weeks after surgery. When can my dog go home? Following surgery, your dog will be hospitalized for several days. Bladder and bowel control are often lost when the dog is paralyzed. It is better for your dog to remain hospitalized until control of these functions has returned. It is generally better not to extend hospitalization beyond seven days because regaining the ability to walk partly depends on exercise and motivation. Since motivation is such an important part of the recovery process, we encourage you to visit your dog starting a few days after surgery. "Recovery is dependent on four factors: whether permanent damage was done before surgery, if the surgery relieved the pressure quickly enough, if physical therapy can be performed at home, and if the dog is motivated to recover." If paralysis was present before surgery, your dog may not be able to walk when it is discharged from the hospital. You will be given detailed instructions on the procedures that should be performed. Recovery is dependent on four factors: whether permanent damage was done before surgery, if the surgery relieved the pressure quickly enough, if physical therapy can be performed at home, and if the dog is motivated to recover. Can my dog slip a disc again? The answer is "yes". However, as discussed above, not all disc herniations require surgery. What if the myelogram is normal? Spinal Shock. This is a temporary loss of spinal function that is generally associated with trauma. It occurs suddenly and is somewhat like a concussion of the brain. It may leave permanent damage or full recovery may occur. Recovery from spinal shock generally occurs within a few hours to a few days. Fibrocartilaginous Embolism. In this condition, a small amount of disc material ruptures and gets into one of the blood vessels leading to the spinal cord. As the vessel narrows, the disc material obstructs it, depriving a certain segment of the spinal cord of its blood supply. Without proper blood supply, that segment of the spinal cord dies, resulting in paralysis. Surgery will not help these dogs because there is no pressure on the spinal cord. Often, paralysis involves only one rear leg, or one rear leg is more severely affected than the other is. Complete recovery may occur in a few days to weeks, or there may be permanent damage to a portion of the spinal cord. Diagnosis of fibrocartilaginous embolism is based on the correct clinical signs and a normal myelogram. Unfortunately, a definitive diagnosis can only be made by performing a spinal cord biopsy after death. Degenerative Myelopathy. This is a condition where the spinal cord is slowly dying. It results in progressive paralysis that begins with the dog dragging its rear feet as it walks. This is called "knuckling over" and results in the toenails of the rear feet being worn because they drag the ground with each step. It progresses to weakness of the rear legs, then paralysis. It generally takes several weeks before paralysis occurs, and generally occurs in large breeds of dogs, especially German shepherd dogs. 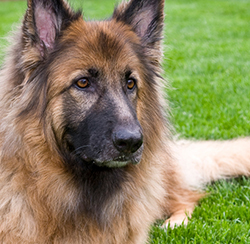 It is often referred to as "German Shepherd Dog Disease" or "Alsatian Disease". There is no treatment and ultimately causes loss of urine and bowel control. Diagnosis of degenerative myelopathy is based on clinical signs, breed and a normal myelogram. Confirmation requires a biopsy of the spinal cord at time of death (for further information on this disease, please see the Client Education Handout "Degenerative Myelopathy"). "A normal myelogram in a dog with slowly progressive paralysis is very frustrating..."
A normal myelogram in a dog with slowly progressive paralysis is very frustrating because the two most likely diseases, Fibrocartilaginous Embolism and Degenerative Myelopathy, cannot be confirmed without a necropsy (an autopsy on an animal).